**UPDATE** Sadly, as of July, 2018 Feline Good is closed. Not only are Feline Good's cats super energetic and playful, but Hollie, the owner is so lovely, cheerful and friendly, the enthusiasm in this pretty cafe is contagious. The eight cats in residence love being around people so much that I wondered if they had a touch of dog in them? Handsome Freddie stole my heart immediately. He also turned out to be a fantastic model and I was able to capture such gorgeous photos he earned a spot on the coveted 'Most Photogenic' list. Then there was Marie, Ash, Marshall, Rory, Winston, Penny and Black. 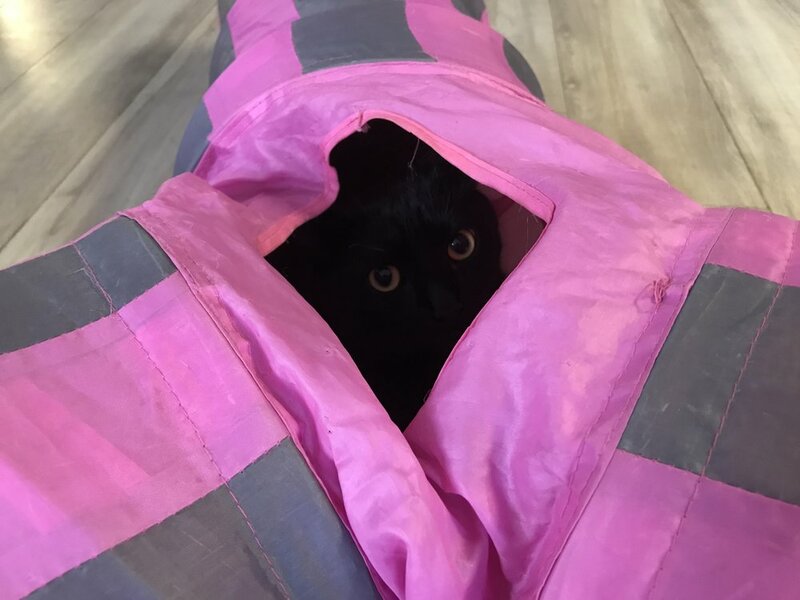 They showed me how much they love to play by diving into the pink nylon tunnel, chasing strings and taking a spin on the huge cat wheel. Such personalities, I loved them all! I haven't even gotten to the food yet. Our tea and coffee were beautifully presented and tasted wonderful, but OMG, I am going to be dreaming about that Chocolate Peanut Butter Cup for years to come. We had such a great time visiting with Hollie and playing with the cats, it was difficult to leave. If you have the good fortune of living in Cardiff or plan a visit to Wales, make sure and add Feline Good to your list of 'things to do'.